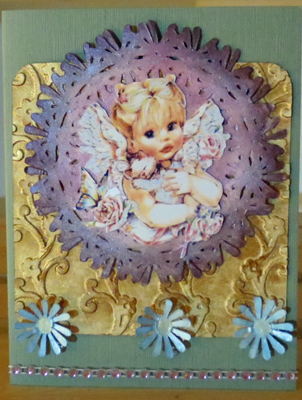 Over at the Silhouette Plus Forum there is a challenge for making a cluttered card using a doily that you have designed. Luckily Doodlingdebbie has a fabulous video for how to do that. I was surprised at how easy it is to do so don't be surprised if in the future you see more doilies used. Here is my card. For this card I cut a rectangle out with rounded corners. I then brushed gold paint onto my embossing folder. 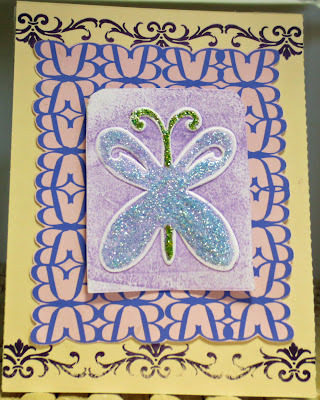 I used the full size folder from Sizzix's Best Friend embossing set. I used a flower file to make my doily. I painted it with Perfect Pearl and pearl watercolor paint. The angel was left over from a bunch I printed and cut for my sister. The flowers were cut out for a previous project and I changed my mind. They were painted with pearl watercolor paint. The gem ribbon I bought on sale a long time ago. It was suppose to be adhesive backed but I discovered that I have to use glue to adhere it. Now my faithful readers I must inform you that I will not be crafting for about six weeks. I'm in the process of getting ready to move. I'm excited because I'll have a separate room for crafting. It will be fun to organize things and decorate a new place.I'll try as soon as possible to start crafting again and sharing with you my creations and frugal tips. I had seen this technique used on a blog and so found a video how to do it. It does take awhile for the background to dry and I may try it later using something else for the color like acrylic ink. 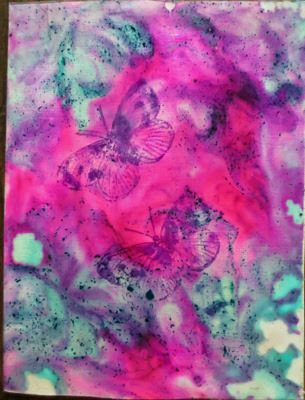 I did not like how the blue color of alcohol ink left specks, It ended up pretty much having one of the butterflies hidden. I cut a piece from a sheet protector for my clear plastic. I stamped with Stazon ink using a butterfly rubber stamp I found while sorting through a box. To do this you will need to use a ink which you can stamp on a glossy surface without it smearing. After making sure the ink was dry I turned my plastic over. Then the fun began as I got messy with glue and alcohol inks. Of course I had to use my fingers. When I was done swirling the colors of glue around I put it in a safe place and went off to see a movie. Although the glue appeared dry when I got home I decided to be on the safe side to wait until today to put my card together. Because the sheet protector is not as rigid as other plastic my next dilemma was how to attach my background to my card base. I decided to go with the same glue I had used for the background. I applied with my fingers swirling along the edges. Some of the color was picked up in the white glue. I then placed it under books to dry and flatten out as the card base wanted to curl. In person this is glossy looking but I ended up having to take this in low light so there would not be a glare. I'm thinking this would be a fun background to make without the stamping. Since I have an almost empty bottle of white glue which I don't really want to pack (I'm too frugal to just throw it out) I just might have to do another one trying it with my acrylic ink. Is this something you might try? How about something you might have your children try when they are bored with school out? I know I definitely will try this with my grandchildren. Back to sorting,packing,and getting rid of things. It is amazing to me how much I've accumulated over the years. Wishing you Frugal Happy Crafting till we meet again! Thursday I received from Studio Calico a box full of goodies which I recently won. Yesterday and today I was playing with the Mister Huey color mists and the masks on scrap pieces of cardstock. With the mask with the icons I'm going to have to practice more. I couldn't quite get the hello one to come out perfectly. Here is the card I came up with. After playing with this triangle mask and gesso as well as texture medium I decided to just use the spray. I sprayed the three different colors randomly and this is what I came up with for my background. I had originally printed and cut the bird out with my Cameo but then I realized it was the wrong colors and too large for the card I wanted to use it on. The bird was a Dover Sample at one time. I think I have downloaded most of the samples as I'm lucky if I can download three new ones a week. I took the mask that has the icon and sprayed a whole page. I used the First Kiss color mist and it turned out darker and more orange like using a vanilla color of cardstock. Once it was dry I stamped my sentiment on one of the shapes and then cut it out. Hope you are having a good weekend. It is overcast and has been raining off and on. A good day for crafting as well as sorting through things. This is another technique of the week card. The instructions for making the starburst are from the April/May newsletter from Technique Junkies. This would be an excellent way to use up scraps. 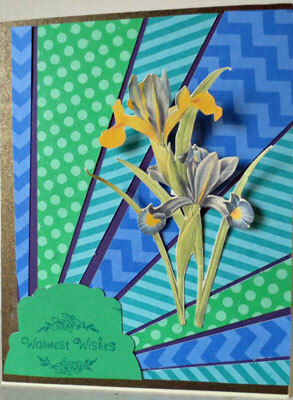 The pattern cardstock I used is Learning Center from Dollar Tree. I grab a bunch of it whenever I find it as it is a bargain at 10 cents a piece. I also love how nicely it cuts with my cutting machine. I could have used more than the three patterns but decided to go with three. I bought at JoAnn's some purple cardstock and it does not cut nicely so I decided to use it for the background for my pattern pieces. I had cut black cardstock out but the colors don't t pop like they do with the dark purple. Using a scrap of the green dot cardstock I cut out the frame shape. I love how the cardstock is solid on one side. I ended up cutting the shape in half. It worked better for my design that way. The Iris is a Dover sample which I turned into a print and cut. I glued the bottom stems down flat and put foam squares under the flowers to lift them up. I took a large size scrap of metallic cardstock and cut out the panel to adhere my starburst panel on. I have been unable to find my metallic markers so the cardstock created a nice border. Like usual this card evolved while I worked on it. In fact I had originally planned to use another image. After I did a print and cut I decided it would be better on a different card. After sitting for a few days Cameron my Cameo was happy to be put to work. Of course I could have cut out the pattern pieces using my paper trimmer but that wouldn't be any fun. Especially since my paper trimmer and I have a love/hate relationship. It is probably time to look and see if I can find a replacement blade for it. If you have scrap paper consider using it this way. Thank you for stopping by and do come back. Wishing you Happy Frugal Crafting till we meet again! I've seen this technique done several times on different videos but never did it before as I didn't have glossy cardstock. Then I found some glossy blank cards which I have no idea what I bought them for. Sorry the picture does not do this card justice. 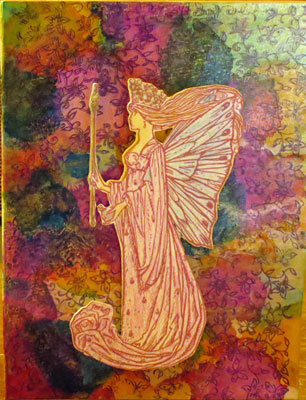 It shimmers from using pearl watercolor and gold acrylic paint. I used a combination of alcohol ink and soap dye leftover from my soap making days. Alas I ran out of canned air. I didn't like the bare spots so decided to brush a pearl watercolor over it. That is when I discovered that soap dye is water based. I did get a beautiful pearl green out of it. Then I thinned gold acrylic paint and brushed it on. I waited a couple of minutes and then took a paper towel and placed over it letting the paper towel soak up the puddles and giving a nice texture. I wanted to add a stamped element since my goal is to stamp on every card. 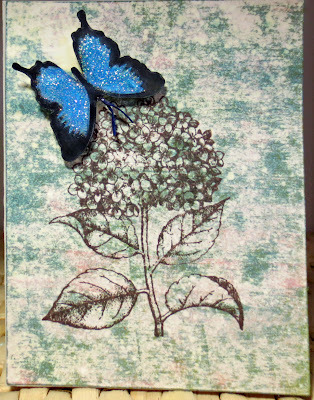 I decided to go with a background stamp of flowers and butterflies. I don't have black Stazon ink so had to use my royal purple. I held my breath hoping that I would get a good stamped image as this background stamp can be fussy at times and not stamp crisp. The fairy is an image from Dover. It was a little tricky turning the image into a print and cut with point editing. I'm pleased how nicely though she turned out. I colored her in with colored pencils and chalk. I also used crystal glitter on the top of her wand and the ornament she is holding. There you have it my frugal card using supplies I have on hand. Thank you for stopping by and do come back. Wishing you Happy Frugal Crafting till we meet again! I had fun with my acrylic paints to make the background. The sweet girl is from Dover. 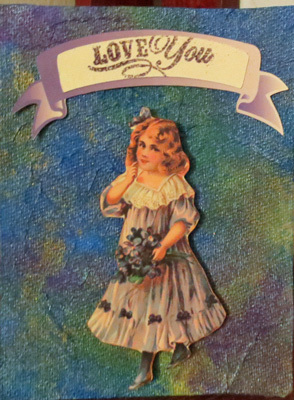 After she was cut out I edged her with Vintage distress ink and then pop dotted her on the background. The banner was at one time a free file from Silhouette. I don't know if it still is. I turned it into a print and cut by filling in with graduated color. Then had my Cameo cut just the edges. I cut a separate piece for the sentiment. The sentiment is stamped and heat embossed. Once in awhile I just have to take some time out of all the craziness in my life lately and play. 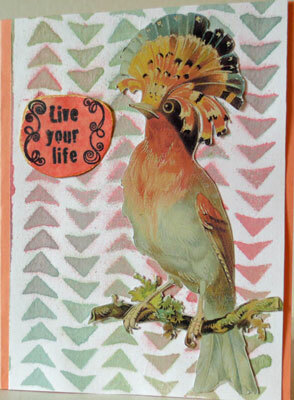 I bought Thursday a couple of stencils and stamp sets and had to use one of the stencils and one of the stamps. 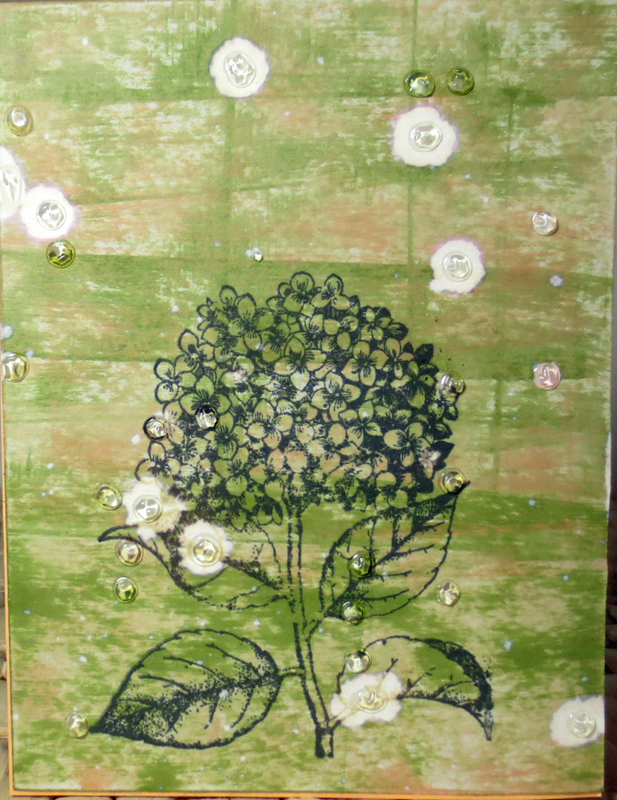 I tinted moulding gel with acrylic ink and used it to stencil with. Once that was dried I went and sprayed with my homemade color wash. Then after it sat for a couple of minutes I took a paper towel to rub the excess off. The green panel is a bubble play piece. It doesn't show up but the background actually shimmers because I had tinted the bubbles with glimmer mist. I stamped with Tuxedo black ink on a scrap piece of cardstock and then cut out by hand my stamped image in a shape. Then I colored it with my metallic colored pencils which I recently found. I inked the edges of it with gold ink. I felt like the card needed something so added the ribbon at the bottom. It really makes the stamp image pop. I had too much gel on my brush when I stenciled so the stencil stuck to the cardstock and in places part of the top layer of cardstock ripped. I think I like though the distressed look that it gives. 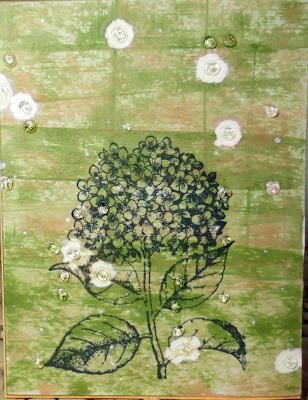 I definitely like this stencil and can see a lot of possibilities using it. I also like the flower stamps and I think the set will see a lot of use. I went to the beach yesterday and had gorgeous weather so the Stickles I applied before leaving had time to dry without me messing it up. Or putting the panel somewhere safe to dry where I forget it. I hate when I do something which requires drying and then mess it up before it is dried. Technique Junkie has for the technique of the week the embossed stickles technique. I thought this would be the perfect time to use the mini folder which is part of the Best Friends set by Sizzix. The set is alas a retired one. Here is my card. 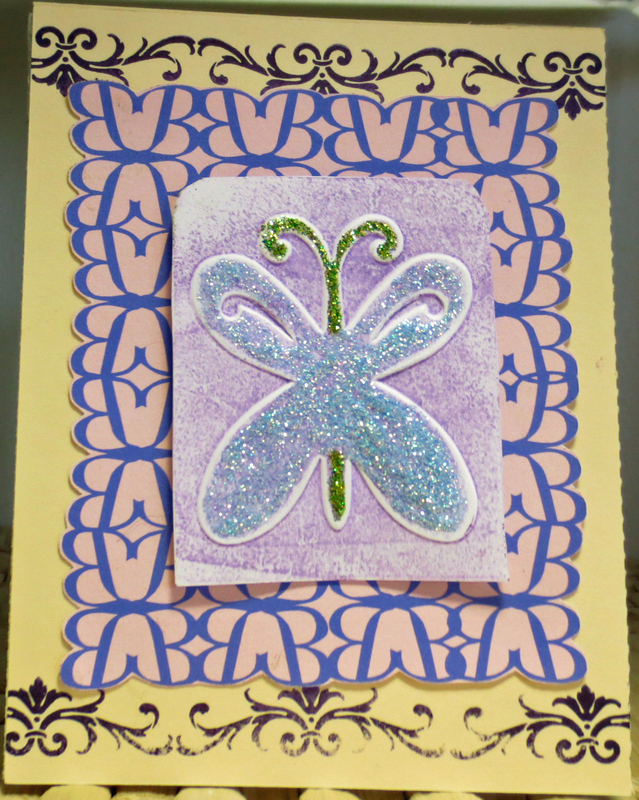 I inked the butterfly folder before embossing. The background it is on is my own design I made in Studio the software for the Silhouette cutting machines. The top and bottom border is a stamp by Stampendous. I meant to have them stamped closer to the edge but decided to go ahead and use this panel instead of restamping for the fourth time since I was having a difficult time getting a crisp stamped image. Since I already broke my moratorium on not buying crafting goodies yesterday I will be buying more stickles. Sad to say but this is the only two colors I own. I found a birthday set of clear stamps at a thrift store for under $3 and since I don't really have birthday sets I had to purchase it. My big find though was a rubber stamp with a fairy which looks like it has never seen ink. Of course I also had to stop at my favorite Scrapbook store and buy some more stencils and a set of stamps with a vintage feel to them which were on sale. I bought two stencils and the stamp set for what the stamp set was priced for originally so I don't think I did too bad and I know that these things won't sit gathering dust. I'm more discerning these days about what I buy. Off to do more packing and sorting. One thing about doing this is I realize seeing all the abundance around me how blessed I have been. Thank you for stopping by and leaving comments. Do come back. Wishing you Happy Frugal Crafting till we meet again! I must confess I was procrastinating yesterday and tried the Splattered Bleach technique that I read about in the Technique Junkies newsletter. I did my brush a little differently on the second card and like how that one turned out a lot better. However, doing the technique with the bleach I used with the first card could make a interesting snow card by using glitter on the drops instead of crystal lacquer or Dimensional Magic. More experimentation will need to be done using different size brushes and using the brushes in different ways to get my splatters. Of course now I'm wondering how it would turn out using bleach in a mister and spraying it on. 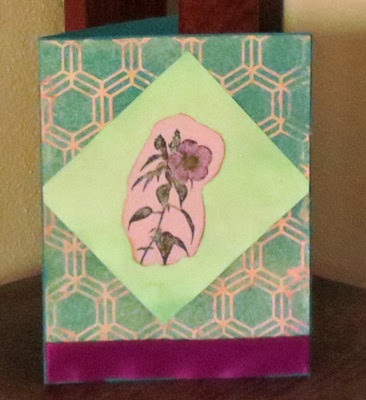 This card here I was surprised at the colors that the background turned out being as I dragged the same distress ink pads over my cardstock as I did in the first card. I decided to add a print and cut butterfly from the library in Studio. I added scrapper floss for the antenna and used stickles on it. O.K. I need to go back and finish sorting through things in a dresser drawer so I can get rid of the dresser this week. So much to do and so little time to do everything in. Thank you for stopping by and do come back. Happy May Day! Wishing you Happy Frugal Crafting till we meet again.